An expected 5,000 people of all ages gathered to enjoy soothing jazz, delicious food, and refreshments at the 20th Annual Michigan Jazz Festival. 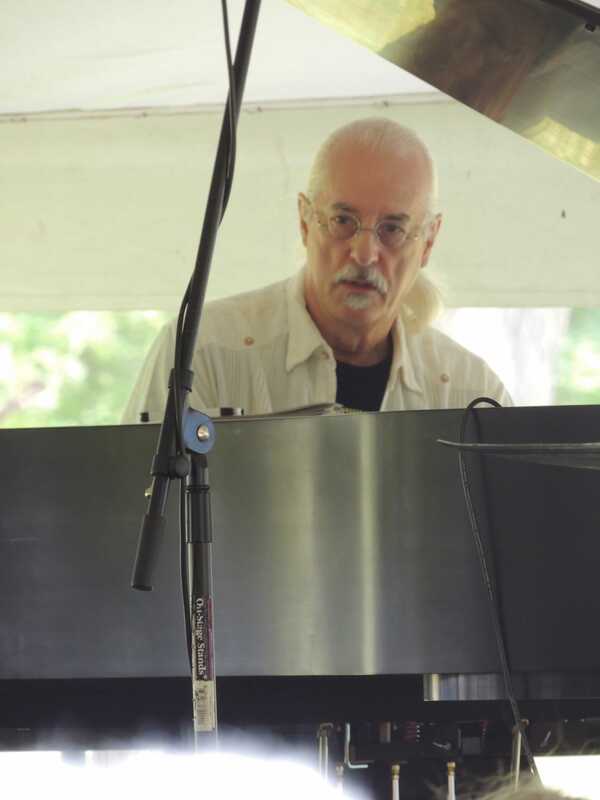 Schoolcraft College hosted the free festival for the public Sunday, July 21, from noon to 9 p.m.
Bill Meyers (piano) and Bill Bolle (bass) from Dave Tatrow Dixie in yellow tent. Stages with seating were set up in in six locations in the VisTaTech Building, including the DiPonio Room, Henry’s Café, the Presentation Room, Rennolds Room, the Lower Waterman, and a yellow tent outside. “I like the jazz variety of music and venues. There is no problem parking, good food, good music, nice people, and it’s a free relaxing afternoon, which draws a lot of people in,” said a West Bloomfield resident attending the Michigan Jazz Festival for the seventh time. Twenty-seven bands from all over Michigan performed while Tony Dixon, Jim Gallert, Paul Hunt, Ken Murray, Michael Nastos, Barrie Woodey, and Linda Yohn — all known for their background in music — acted as stage hosts throughout the day. Bands of different ages, sizes, and experience played at the festival, all with their own intentions for the day. While some bands have played together at the Michigan Jazz Festival for many years, others were there to pick up some fans while enjoying the atmosphere for the first time. Dave Tatrow Dixie performs in the yellow tent. Guests had a chance to meet musicians and purchase their CDs behind glass doors in the Presentation Room, and the Jazz Walk extended down the hall by the Steinway Solo Piano Room. The Jazz Walk ended in the air-conditioned comfort of the Kadish Atrium. First held at Freedom Hill in 1995 and at the Botsford Inn in Farmington Hills from 1996 to 1998, Schoolcraft College has hosted the event since 1999, and in 2012 became a contributing partner. Donations and volunteers are crucial to the continuing growth and success of the Michigan Jazz Festival, along with President Conway Jeffress and Liberal Arts and Sciences Dean Cheryl Hawkins, who are largely responsible for the coordinating the event. “We planned to go last year and ended up with complications. We will make sure it’s on the agenda next year – as long as you guarantee the weather,” said Charlotte Holland, Northville resident and first-time attendee. Rain or shine, Schoolcraft plans to keep the tradition of hosting the Michigan Jazz Festival every year on the third Sunday in July.